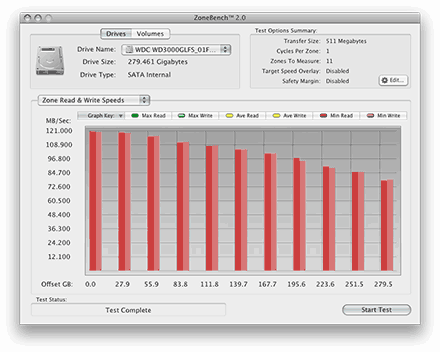 The drives were tested in a 2008 Mac Pro (dual quad-core 2.8 GHz) with 8GB RAM in Mac OS X 10.5.x. All drives were blank/empty. All results are in MB/s unless specified differently. In this test I included both the full disks, as well as a 32 GB partition of the disk drives – the same size as the SSD. Partitioning is a common way to improve random access performance, as it limits the read/write head's seek area. For the Raptor the 32 GB partition is about 21.3% of its full size. For the Velociraptor it's about 10.7% of its full size. In this test 10,000 reads or writes of 4 KB are done in a "butterfly pattern", alternating between start and end of the drive and progressively working toward the middle, and continuing back to the end and start of the drive. The partitioning trick did help: the 32 GB Velociraptor performed 37% better than the full disk, and the 32 GB Raptor partition performed 32% better than the full disk. It's obvious that the disk drives are at a disadvantage due to mechanical delays: The moves of the read/write heads (which I limited somewhat by using only a small partition) as well as the rotational latency (it takes 6ms for a 10,000 RPM disk to spin once). As we've seen earlier, random writes are the SSD's achilles heel because of it's erase blocks, so performance is not nearly as good as the random reads. Disk drives on the other hand are able to cache written blocks and write them later. The partitioning trick helped with random writes as well, improving the score of the 32 GB Raptor partition by 20% and the score of the Velociraptor partition by 30% compared to the full disk. The end result is that while the SSD is 11% faster than the 32 GB Raptor partition, the Velociraptor partition beats the SSD by 6% – however without partitioning the SSD is 13% faster than the Velociraptor (and 43% faster than the Raptor). All QuickBench tests were done with the "Allow cache effects" option enabled, so after each transfer the test will pause for a bit and allow the drive to read-ahead to the cache or flush the cache to disk. The default values of 30ms read delay and 20ms write delay were used. This option affects only sequential tests. The Velociraptor is in the lead across all file sizes. The SSD performance is mostly in between the two disk drives. The Velociraptor is in the lead again – it shows that it has a SATA-300 interface, whereas the Raptor and the SSD have a SATA-150 interface. Note these high speeds (up to 238 MB/s) are reached thanks to the disk cache. The SSD is almost 15 times faster than the Raptor at 4 KB reads, and still 44% faster than the Velociraptor at 1024 KB reads. Note the Raptor is faster than the Veloricaptor at small reads up to 128 KB. The SSD fares poorly in this test, because of its achilles heel "small writes". Apparently there are not enough (or not distributed enough) writes to make up for it with its access time advantage. This achilles heel of the SSD is due to "erase blocks": Wherease a disk can write small blocks of typically 512 bytes in size, the blocks are much larger for SSDs. First, the block has to be read into the cache, the data changed in the cache, and the full block written back to disk. So small writes have a lot of overhead. I don't know how large the erase blocks are for the MemoRight GT SSD, for other SSDs they can be as small as 16 KB or as large as 1 to 4 MB (reportedly). I'd venture a guess that the erase blocks are rather largish for the MemoRight GT, so it reaches good random writes scores only if the blocks are large enough. The Velociraptor makes good use of its cache once again. As the transfers get larger, the cache isn't as much use and we see the disk's actual transfer rates, which mostly depend on data density, ending up at 121 MB/s for 100 MB transfers. The Raptor reaches 97 MB/s at the 3 MB transfer size but mostly it stays close to its actual transfer rate. The SSD reads data at about 121 MB/s no matter the transfer size. Both disk drives make use of their cache to buffer writes, and performance drops noticeably as the transfers become larger. The Veloricaptor writes 100 MB transfers at 117 MB/s, the Raptor at 84 MB/s. The SSD writes about 132 MB/s no matter the transfer size. Large Transfers from the outer to the inner part of the drives show the highest and lowest achievable transfer rates. 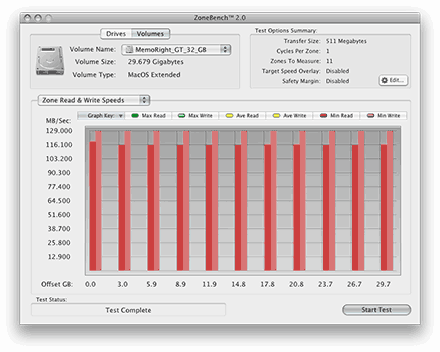 Both disk drives become slower towards the end (inner part). Contrary to the disk drives, the SSD maintains its transfer rates across the full capacity. KONA System Test with 4 GB file, largest frame size, file system cache disabled. Helios LAN Test, average of 3 runs with 300 MB files. The Velociraptor has very high transfer rates and is close to the SSD. This is the only real world test and was done by duplicating a file or folder on the drive in Path Finder. The results are calculated as (file-size/duplicate-time) – this number should be multiplied by two to get combined read and write throughput. File: Duplicating a large file on the SSD results in almost the same throughput as large sequential transfers. The disk drives on the other hand have to move theirs heads back and forth and thus lose some points compared to their pure read or write throughput. 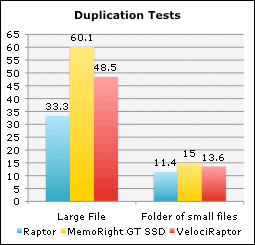 So while the transfer rates of the SSD and Velociraptor were pretty close in the earlier tests, the SSD is 24% faster when duplicating a large file. Folder: As shown earlier, the SSD doesn't do well with small non-sequential writes. But thanks to superfast non-sequential reads it still manages a 10% lead over the Velociraptor. The XBench scores show pretty much the same thing as the QuickBench tests. The SSD and Velociraptor are close in sequential reads or writes. Both disk drives beat the SSD in random writes (by a factor of about four), and are beaten by the SSD in random reads (by a factor of almost three). The VelociRaptor is a worthy successor to the trusty Raptor with leading performance in the desktop hard drive segment. The VelociRaptor's seek noise is a lot less obtrusive than the Raptor's, and while it's still audible it doesn't bother me personally. With its 300 GB capacity it might even be spacious enough to hold all data you might have, and if not it's always a good idea to get a second harddrive to distribute the load and data. Personally I'm a big fan of using a fast drive like the VelociRaptor for the OS, the applications and the user home(s), and a second drive like the Samsung F1 to hold large media data like music and videos. Plus having another internal or external drive to back up all data to is a must-have in my opinion. While I'd prefer using the MemoRight GT SSD instead of even a hard drive as fast as the VelociRaptor, its price/performance ratio is way off for desktop use in my opinion. I've been using it as a system drive for over a month now, and its performance is great – most notably when launching applications for the first time after boot, thanks to its excellent random read performance. By putting all of my login items onto the SSD my account is usable almost instantly after login (Previously I had the login items on the Raptor, and it took roughly 20s to open them). I'd really like to have a 128+ GB solid state drive to hold the OS, applications and my user home, but that would set me back like $3,569 (that's the current price of a 128 GB MemoRight GT at DV Nation, though I've seen it on eBay for $2,795 today). I guess I'll try to sell my 32 GB unit for now (will use the VelociRaptor instead) and wait until fast SSDs become more affordable. Now server use is different, I believe that this SSD is the perfect fit for many a server application. Obviously anything that performs mostly random reads is a prime candidate – say a web server for example. Applications that require a high number of IOPS are also good candidates, e.g. a general file server. 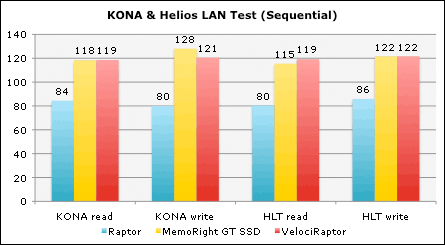 While I didn't do any specific IO load tests you might want to check out the StorageReview performance database – for example have a look at the Multi-User Suite results of this MTRON SSDs vs SAS harddisks vs SATA VelociRaptor comparison. With the 8800GT fanless (with Accelero S1. Rev 2 cooler swap) I've never seen the HDD go above 25 degrees celcius; not even when taxing all 4 cores with a Handbrake encode. Yeah, it's pretty low. But I guess the "IcePack" heatsink does help. FYI - OWC now has the VelociRaptor Model WD3000HLFS ("backplane ready") that mates with the Mac Pro HD bay connectors without any mods.